Standard - $85.99 Only 1 left! People told you to watch your manners when you went to Japan. You chose to ignore them. You put your feet up on the bus and talked on the phone on the way to Kyoto. When visiting a friends house, you ignored the slippers at the front door and wore your shoes all over the house. You blew your nose while waiting in line at the store. And you insulted the sushi chef that put together your sashimi by dressing it in wasabi and soy sauce. Plenty of glares came your way with that one. And yet, you didn't learn your lesson! But when you came to a sumo match munching on popcorn and wearing a foam #1 glove you should have known you were going too far. You weren't really in trouble until you got to the ropes and started giving the wrestlers tips. Mansplaining just pushed the wrestlers too far, and now look at the bind you're in! 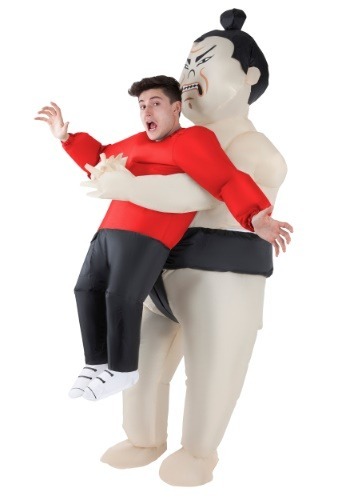 You'll look like you're being carried by an angry Sumo wrestler when you inflate this hilarious costume! All you need to make it work is four AA batteries. The windbreaker material zips up the middle and will fit people that range from 5'4'' to 6'4''. The sumo wrestler's face looks very irritated so you can pretend to be in a lot of trouble while your tiny inflatable flails around in front. We don't know where he's taking you but it looks like it won't be long before you're swimming in the coy pond! We'd love to see what this costume looks like when matched with other folks in inflatable sumo wrestler costumes so it looks like you're among a mob of rioting sumo wrestlers. Now, that's something we'd like to see on the travel channel!